Encore Week continues! My kids favorite post…. they think the existence of the sock jail is hilarious and somewhat embarrassing…. But hey it’s practical and I reassure them that “everyone” has one. Nevertheless, on laundry day the remaining sock from the guilty pair is sentenced to time in sock jail. While this sock followed laundry protocol and its rebellious partner did not, the orphan must still do its time for losing its partner. Sock jail is better than the death penalty, otherwise known as the trash can. In sock jail there is hope. One day the sock could be reunited with its partner, or one that looks close enough to pass, and continue its life of purpose. 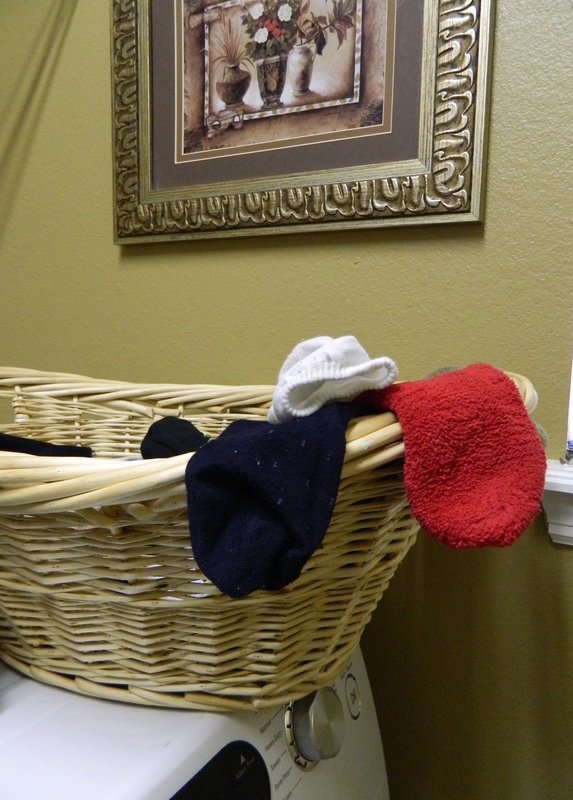 Until then, the socks wait in the jail – a straw basket on the top laundry room shelf. Often the missing disobedient sock will surface under someone’s bed, in the back of a drawer or even odd places like in a bag of dog food (don’t ask). When that happens, the sock owner goes to the jail to check for the mate. If a reunion takes place, there is a moment of cheering and celebrating as the long-separated pair is reunited and able to fulfill its purpose. Like the AWOL socks, sometimes we go through periods of walking on our path before realizing we’ve lost our way. The direction we thought we should take or that seemed right at the time was incorrect. We were misled and now we find ourselves incomplete, separated from God and suffering consequences of wrong choices. It’s then that we need to stop, recognize the error and go back to the path we were meant to walk. It’s there that we meet our Father and begin to walk again in His purpose for our lives. He alone can fulfill our needs. When we are following the path He has set before us, we can live our life in complete fullness and joy. On that path there is peace as the Lord guides our steps and provides for our needs. Much like the parable of the lost son, Jesus teaches in Luke 15 that we are His children and are always able to come back to Him when we’ve missed it along the way. When we repent and turn back to Him, He will welcome us with open arms, giving us His very best. Previous Post Paper, Plastic or Jesus? Very thankful that we are continually given new chances by our loving Heavenly Father. And good luck with the socks in jail, i have heard of sock prison breaks where they attack the warden, better sleep with one eye open tonight. Love your message and your sense of humor. Personally, I have 20 inmates here awaiting pardon. I believe work release may be an option for one of the older inmates, as I need to dust soon. Somebody wrote, ” Please clean” on the dresser last night.